When I saw Cadbury Creme Egg Cupcakes all over Pinterest, I decided to try making them myself–I wait all year for Cadbury Egg season and combining them with cupcakes seemed like the best idea ever. Chocolate or Caramel Creme Eggs – Which is Best? 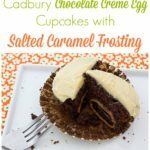 Since the Creme Eggs had been done by so many other bloggers, I thought I’d try using the Cadbury Caramel Eggs in my cupcakes instead. I mean, if the Creme Eggs works, why wouldn’t the Caramel Eggs? When I was looking for the Caramel Eggs, I found the Chocolate Creme Eggs too, so I thought I’d do half the cupcakes with those and half with the caramel ones. I’m glad I decided to do that because the Caramel Eggs did not work out! So yeah, maybe there’s a reason why people don’t use the Caramel Eggs. They melt and leak and stick to the bottom of the cupcake wrapper. You definitely can use the caramel ones if you really have your heart set on it, but just know you might get a caramel-y chocolatey mess when you use them. The great thing about these cupcakes is that the Cadbury Eggs in the middle are the star, so you can really use any kind of cake or frosting you like. Go wild! Or don’t go wild! It doesn’t matter! 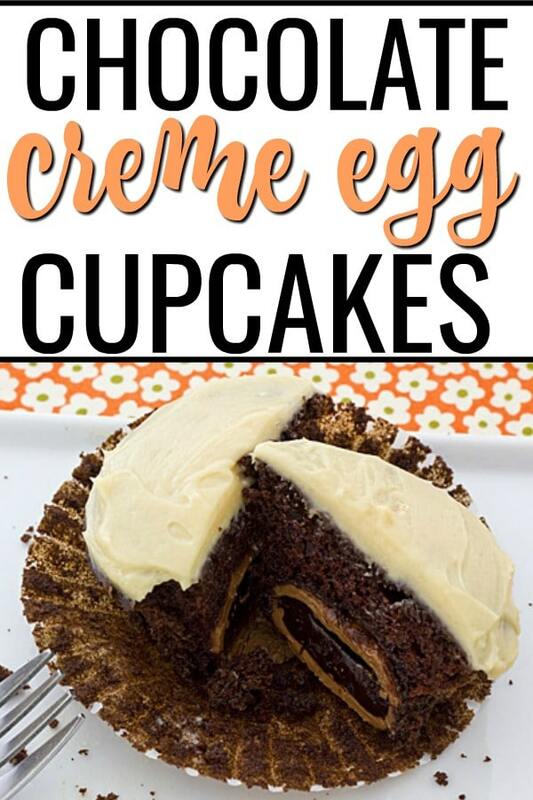 Because no matter what you do with them, your Cadbury Chocolate Creme Egg Cupcakes are sure to impress everyone who eats them. Can you use a Cake Mix? Yes, you certainly can. It will save you a little bit of time. I am sharing my homemade chocolate cake recipe because I found that it has a deeper flavor and amazing texture. Here is a printable recipe card. Don’t forget to pin this for later so you can make it again! Line muffin tin with paper liners. Combine flour, sugar, baking powder, baking soda, and salt in a medium bowl. Combine cocoa and 3 tablespoons of hot water in a large bowl; beat with a hand mixer until a thick paste forms. Add butter, buttermilk, egg, and egg white; continue beating until well-combined. Gradually add flour mixture and beat until smooth. Spoon a heaping tablespoon of batter into cupcake liners. Lay a Caramel Egg on its side in each liner; carefully spoon remaining batter to cover eggs. Bake for 20 minutes. Cool in tins for 10 minutes then carefully (very carefully--you don't want to break the eggs!) transfer to wire racks to finish cooling. Whisk together granulated sugar and water in a small saucepan. Once combined, stop whisking and turn on heat to medium-high. Bring to a boil and continue cooking, without stirring, until mixture is a dark amber color and begins to smell caramelized. Remove saucepan from heat. Gradually add in cream and vanilla, stirring with a wooden spoon until smooth. Cool for 30 minutes. Using the paddle attachment for a stand mixer, combine salt and butter, beating on medium-high speed until fluffy (about 3 minutes). Reduce speed to low and gradually add powdered sugar. Continue to mix until sugar has been incorporated into the butter completely. Turn off the mixer and scrape down the sides of the bowl with a spatula. Add caramel and beat on medium-high until airy and thoroughly mixed (about 2 minutes). Cover and refrigerate until stiff, about 45 minutes. 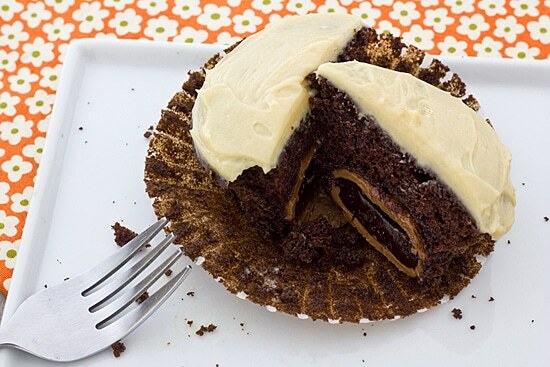 Make sure to print this Cadbury Egg cupcakes recipe for later! If you like this recipe, be sure to check out my Chocolate Lambic Cupcakes with Raspberry Cream Cheese Frosting too! My brother would love these. I can’t stand those Cadbury eggs but I have to say this looks delicious! OMG… This may well be the best thing I have ever seen to eat…. I risk sending my blood sugar through the roof once a year to have Cadbury Eggs… Now, I plan to buy them on the after Easter Sale and stick in the freezer to make these cupcakes for very special occasions. The ingredients list leaves out the baking powder. Make sure to grab it when you’re grocery shopping to avoid two trips out!!!! Oh gosh, those would be a HUGE hit in our home! I will make those for Easter dessert mmmmm!!!! These look great! I see you use my favorite chocolate cupcake recipe too. I’m hoping to make some sort of creme egg concoction this coming weekend. I’m sure glad I saw Shop with Me Mama (Kim) tweet this link! I’m AM making these asap! I even called my hubby into look at them. And just think, I just bought Reynold’s baking cups today…..it’s so ironic! I was just looking at these today, and pondering what to make. Maybe I’ll try this. They sure look good. Salted caramel frosting – yum! I made a browned butter frosting once (ok, more than once) that was incredibly yummy. I may try browning the butter in this recipe. What do you think? Wow this looks amazing! Thank you for sharing yor recipe!